Four Generation: Front: Me and Eliza Jane. 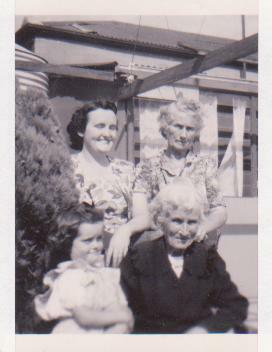 BACK: Mum and Nana, 1950. Readers who have been following this blog for quite a while may remember the first time I wrote about the re-using/ re-cycling of South Australian Graves. It came about because finally I had found the Burial Site of my Susan’s daughter, my great grandmother Eliza Jane (Rowen) Murray, at Cheltenham Cemetery and was having trouble locating the descendants of the now deceased lease holder, Great Uncle Andy, to have the lease signed over to me… That was 16 months ago, on 22 Jun 2012, and that issue has not yet been resolved but I have paid the lease (including back fees) to keep Eliza Jane undisturbed for a few more years although I have no ownership and am unable to erect a decent monument etc, but at least she’s safe. If you missed that story, you can read about it HERE. Many many stories later, the topic of the desecration of South Australian Ancestral burial sites was threatening to over whelm this Blog so a month ago I set up a sister site, dedicated to South Australian Graves under threat, which I wrote about HERE. Some action is finally happening, here in South Australia, and people are beginning to speak out in opposition to this practice of reusing graves. So, HERE is the link to that story and information as to how to contribute to the discussion, if that’s something you’d like to do. This entry was posted in Cemeteries, Graves and tagged Family History, Genealogy, Memoriums, Protecting Gravesites, Re-using South Australian Graves, Remembering by Catherine. Bookmark the permalink. It’s sad to think that our ancestors are not left to Rest in Peace, as their close families believed the case would be when they buried them all those years ago. I’m afraid the same could be happening in England, where my ancestors all are, but there’s not a lot I can do about it from so far away. 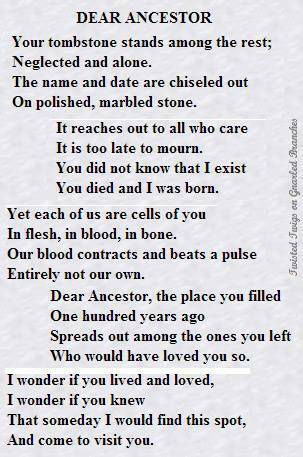 I loved “Dear Ancestor”, thank you for sharing such a meaningful poem today. Joanne, I have the same concern, as I have many relatives buried in England. I recently ran into a woman from England, who said burials in England today are becoming rare due to scarcity of land. Her parents, and other relatives, and eventually herself, will be cremated, and the ashes sprinkled in a memorial rose garden cemetery. One of England’s way of honoring their dead while dealing with a shortage of land to bury them. Personally, I found the cremating and rose garden cemetery a very respectful and beautiful way of burial, but removing those from their rightful spots, and “reusing” them is a different story. Glad you are bringing this issue to life, Catherine! I so agree Mrs Padilly… cremation and spreading ashes in special places is indeed a beautiful way to honour Ancestors for those who choose this way. However, there is certainly not a shortage of land here in this WIDE brown land of Australia… instead it’s all about money, the power that brings and has nothing to do with honouring the past, our ancestors… our history. Thanks SO much for advising me to keep on keeping on… my Doc had advised me to back off because of the toll on my health, with all the negativity, personal attacks, on-line stalking etc but I can’t do that right now. However, seeing others speaking out and demanding change does give hope that very soon I can hand “the baton” over to others. Thanks for your caring, comment and encouragement. Many thanks for your comment Joanne… “Dear Ancestor” always reverberates with me especially when I stand at the Gravesite of my Great Grandmother, Eliza Jane. I thought I would never ever find her and now I’m battling to stop the final resting place of others being destroyed before their descendants can also find them. The poem was very touching Catherine. I’m glad more people are jumping on the bandwagon about the graves. In the old days when people were buried in perpetuity it used to mean forever, not just as long as it suited someone else, and to crush the old gravestones isn’t just desecration, it’s wiping out a piece of history that belongs to someone. I for one would not appreciate going to look at where my family was buried after struggling with a family tree to find no memorial at all. Thankyou so much David… yes this poem always tugs at my old “heartstrings”. You are absolutely correct when writing that it “isn’t just desecration, it’s wiping out a piece of history that belongs to someone.” Seems to me that it’s the same old story re: who is it that writes/ preserves the history etc ? The fact is that here, in the South Australian Cemeteries which re-cycle/ reuse graves, is there also are gravesites which are saved/ preserved because of their “historical significance” despite the lease NOT being renewed. In our supposedly “egalitarian society” I had hoped we’d moved beyond this but clearly not 😥 Big Hugs back always. I am glad that you have managed to save the plot of your ancestor. If you think about it, grave recycling is nothing new – if it were,the countryside would be packed full of huge burial grounds, containing the remains of millions of people all down the generations. I know some very old graveyards here in the Irish countryside, but most of the monuments ( if they exist at all) seem to be 19th Century or later – there are indeed some from the 18th, but they are fewer, and so the numbers decrease as we go back in time. One wonders if recycling went on here too – we cannot know. We also know that new construction projects may reveal old burial grounds from time to time. As someone who does not know where both my maternal and paternal great grandparents are buried because they would not have had headstones,and there are no burial records, I am with you in your efforts to retain the burial sites of your family – it is a vital part of your heritage and your family history. Always so pleased to get your perspective there in the land of my Ancestors Angela – the beautiful Erin. What some would say is happening here is all about money… They are actually digging up the bones of people whose lease has not been paid, burying them deeper and re-selling/ re-leasing that plot to another family. The memorial is removed and another put in it’s place. These are not OLD gravesites. Many leases now are only for 25years… This is a deliberate act of sacrilege, I believe. I am so glad that I found Eliza Jane and WILL ensure that her “remains” are treated respectfully… but sadly I don’t have enough money to keep all of my family left to R.I.P… and I hear this anguish repeated so often from so many other people. Thanks for always caring Angela and especially giving me “food for thought”. Cáit…it seems to me that the solution going forward is simple- graves should be freehold forever, and not leased for 25 years or whatever. That of course does not address the matter retrospectively. My aunt,a religious nun, died in the last 6 years in Scotland- another fairly sparsely populated area. We were shocked to see that there were 3 people placed in each grave- the two who had predeceased her had died in the previous 12 months. although strangers to he family, they were members of her religious order. Then I thought about the grave where my grandmother is buried – it is a single width plot (the norm here is for three coffins wide).There are 8 people now buried in this tiny little plot! I am opting for cremation personally and hope to be scattered to the four winds in some nice sunny spot! Absolutely right Angela re: graves being freehold. Our new South Australian “Burial and Cremations Bill 2013” provides this option. It’s title is “in perpetuity” but we’re yet to see what the cost will be and whether it will affordable to most people or only the “well heeled” ??? It seems that many Australians are unaware of the “lease requirements” on South Australian graves… believing that their loved ones would R.I.P. forever and I strongly believe that our present “legislators” need to take this into account. “the remains” and buries a stranger on top and the original memorial is replaced with that of the new “internee”. The issue here, in South Australia, is not about lack of land/ space… It’s about the value of land in our inner suburban areas and a disrespect for Ancestral history etc. Am now thinking that maybe we need to call for a moratorium. i.e. STOP destroying the graves of our Ancestors and move on with new regulations/ requirements etc… Do you think this would work, Angela? I can remember how appalled I was when I first read your original post on reusing graves. It just seems wrong. I’m glad that people are starting to speak out against the practice. Oh yes indeed Sheryl, I do remember your horror when I first wrote about it. I can’t even begin to say how very ashamed I am to be living here in South Australia, which has led the world in so very many issues of social justice/ fairness and equity, yet considers this disrespect of our Ancestors, destruction of Social History, desecration and sacrilege OK. I know that my Miss Muffly/ your beautiful Grandmother would not at all approve. Thanks for the caring and for commenting Sheryl.